Die Geburt des Alpinen Skiweltcups 1966/67 In January 1966, during the final training session for the forthcoming Hahnenkamm Downhill at the Seidlalm in Kitzbühel, the word “World Cup” was mentioned for the very first time in connection with Alpine ski sport. Journalist, Serge Lange, with head coaches of the French and American teams, Honoré Bonnet and Bob Beattie, spoke about inter-linking the ratings of a series of Alpine ski races to make them more attractive to the media. During the World Championships in the summer of 1966 in Portillo, FIS President, Marc Hodler, announced the “World Cup” for the following winter of 1967, which marked the birth of a success story that began 50 years ago. 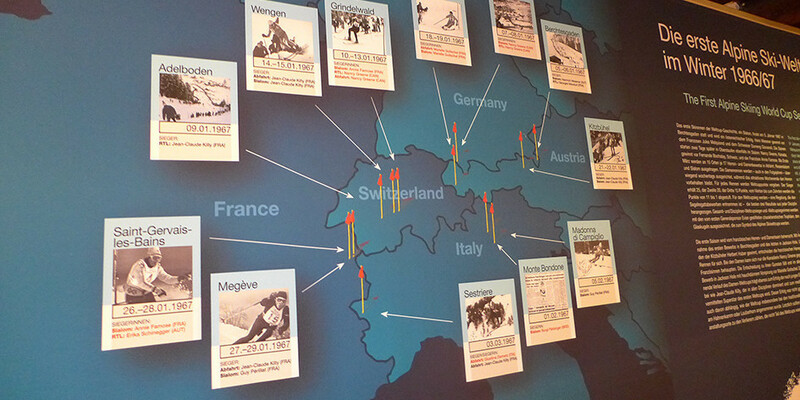 The exhibition illustrates the origins of the World Cup and the first World Cup winter. Trophies, items of equipment, photos and film clips demonstrate racing sport back in the day, the first “World Cup” and the venues of Kitzbühel and Portillo, where it all began. The exhibition at Kitzbühel Museum officially opens on Friday, 4th December. Interviews with cotemporaries of that period will be held during the opening of the Hahnenmann Race Week on Tuesday, 19th December 2016, chaired by sport expert and journalist, Fred Lentsch. The museum is open from Tuesday to Friday and on Sunday from 14 to 18 hrs. Saturday, from 10 to 18 hrs. From 1st February to 15th March the museum will open every Thursday evening until 18 hrs, after which a guided tour through the “WORLD CUP” special exhibition and Walde collection starts at 18 hrs.